The wonderful world wide web has made fishkeeping an adventure that can be shared as never before. It's not like it was twenty years ago when I set up my first tank--I had my books, but nobody to talk to who actually had experience doing what I was trying to do. How I would have loved to have a reliable forum to visit in those days when I had a question! Not only have I been able to share information and learn from others' experiences online, I have made some wonderful friends as well, and I'm delighted that some of them have agreed to share their experience here on this site. I hope to persuade some of my other friends to contribute as well (hint)! The first article below is my good buddy Dawn's discussion about the one malady everyone will have to treat sooner or later--ICH. Resign yourself to the fact that you WILL at some point bring home new fish that are infested with ich, and be prepared ahead of time. The good news is that while you'll undoubtedly have to deal with it at some point, you CAN cure it. Ich is the world's best argument for a maintaining a quarantine tank! If you make sure your new fish are ich-free BEFORE they go in the display tank, you're unlikely to ever see it again--until you bring home some more infected fish, that is. The second article is from my friend Jan (Queen of the Iron Range! ), and should be must reading for anyone who ever saw a cute little fish in a fish store and took it home before finding out what it was! 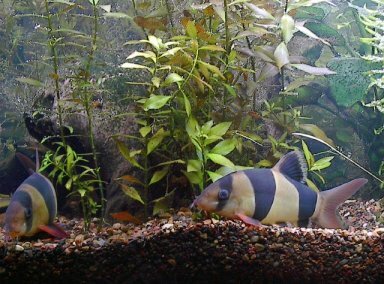 Two clown loaches (Botia macarantha) playing tag. Loaches are great fun to keep, and certainly brighten up the place with their vivid coloration, but they are sensitive to poor water conditions, and extremely susceptible to ich. Worse, they are very sensitive to the most common ich medications because they're scaleless. Ich can quickly overwhelm a loach, and prompt treatment is necessary. Read about how to treat them in Dawn's article, "My Fish Have WHAT?" Beautiful, isn't he? He's a bala shark, and I'll bet you saw some cute little guys just like him, about two inches long, the last time you were at your fish store. Except....see that guppy at the top of the picture? Hmmm...what the heck happened to that cute little fish, anyway? Surprise, surprise...he grew to be a foot long and as big around as your arm! Find out about him and some others like him in Jan's article, Impulse Fish--Gentle Giants.